Many low-income Pittsburgh residents living in food deserts struggle to obtain fresh produce on a regular basis. As a team, we aimed to research this issue and develop a sustainable intervention that would reduce dependency on food banks and soup kitchens in the long-run. At the start, we met with various stakeholders to understand their relationships to one another. In doing these contextual inquiries, we learned about the challenges they face in regards to transportation and employment. These two factors really get in the way of them being able to provide food for themselves and for their loved ones. We synthesized our research by making artifacts to help guide our decision making process. These took the form of user personas, journey maps and affinity diagrams. For our deliverable, we developed two different interventions that we proposed to stakeholders. 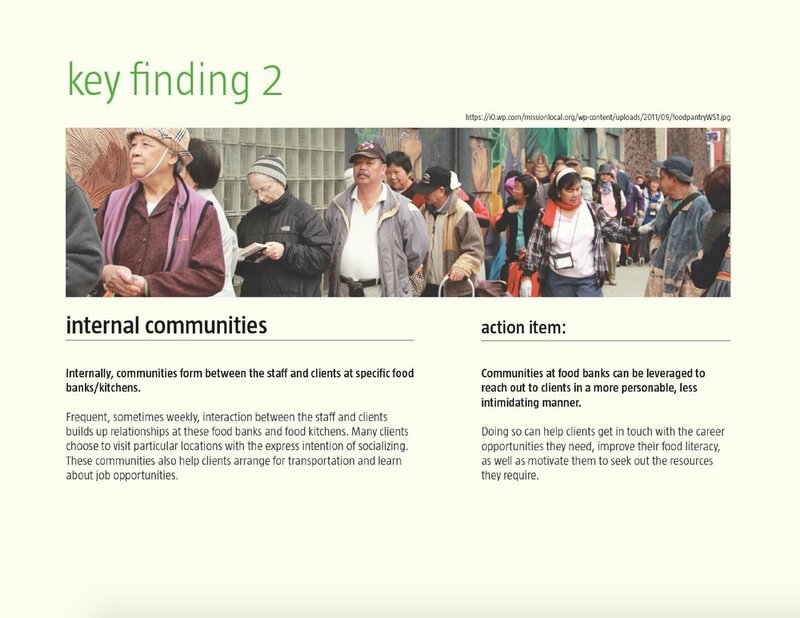 One intervention defines a framework for a Co-op that could be adopted by food banks to reduce client dependency on resources while the other spreads knowledge about healthy meal recipes within the community. This 8 week project was done for the HCI course, "User Centered Research and Evaluation". A few months ago, I couldn't tell you what the definition of a food desert is. I had no idea that so many Pittsburgh communities exist within a food desert. With so many popular restaurants opening up downtown, you would never know...To begin our process, we first researched what we could on the state of food deserts at both the national and local level. Before we could conduct any field research, we needed to first equip ourselves with enough basic information. Our team scanned through various research papers, articles and data sets on the subject matter, compiling questions that we had for ourselves and for members in the community. What issues are food banks and kitchens facing today? What problems do the clients face? 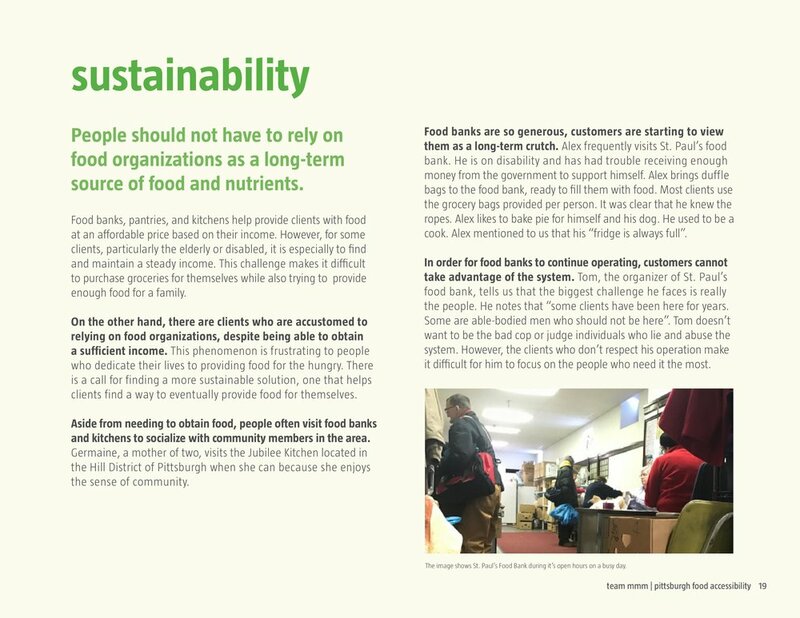 Once we had a good grasp on the issue, we started reaching out to organizers and members of food banks and kitchens in the area to better understand the situation through their lens and experiences. An interactive map that shows people where the food deserts are in Pittsburgh (Post-Gazette). Based on our initial research, looking into the state of food deserts and accessibility around Pittsburgh, our team developed a clear mission statement. We chose to focus on three areas in particular: food insecurity, food education and affordable access. Our mission statement is to help in diminishing food insecurity through education and affordable access. 1. 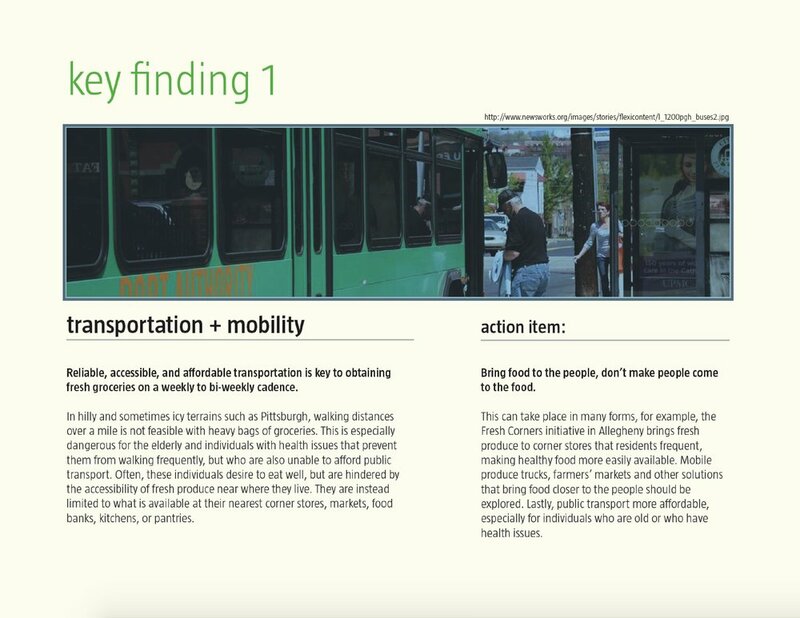 How do we improve access to public transportation across Pittsburgh for those in food deserts? People struggle to obtain healthy foods because they cannot make the trip to the store. 2. How can we encourage better decision making when it comes to selecting and preparing what foods to eat? We want to better educate people about the benefits of eating healthy. 3. How can we create a sustainable and cost-efficient solution that regularly brings healthy food to people in food deserts? We want to explore the benefits of bringing food to the people instead. These issues are important for us to care about because the negative impacts affect more than just the people who struggle to obtain fresh produce on a regular basis. Narrowing our target audience to be more specifically focused on an area of Pittsburgh. Photo of the "Nutrition Newsletter" passed out at the local food bank. Key Finding #1: The lack of transportation should be a main concern. Pittsburgh is notorious for its hilly terrain and harsh weather conditions. This makes going to the grocery store, which usually is over a mile away, more difficult both physically and psychologically. When we started interviewing members of the local food kitchens and pantries, we found that many of them have a strong desire to eat well. But the lack of access to transportation gets in the way of doing so. Key Finding #2: Food banks are only temporary solutions. A key finding we discovered is that the solutions in place as of now, act only as a temporary band-aid and don't tackle the issues holistically on a national scale. Community gardens and food banks, for example, really only benefit those who are nearby and have easy access to them. Solutions should provide those in need with longterm access to healthy, fresh produce. These individuals should not have to put in extra work just because they lack transportation and are situationally disadvantaged. Giving food to the hungry only alleviates the issue for a period of time. Unfortunately, it does not get rid of the problem completely. Entire communities need to get involved in order to elicit some measure of change. 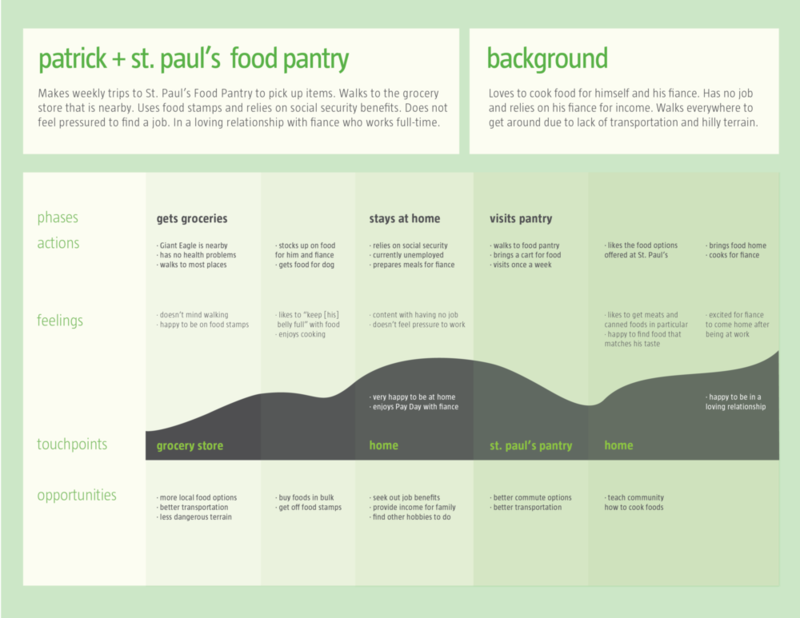 Our team spent two weeks doing contextual inquiries with members of nearby food banks and pantries. We made visits to Jubilee Food Kitchen, CHS Food Pantry and St. Paul's Food Bank. Going in-person to these locations allowed us to get to know visitors on a more personal level. We asked questions about transportation and food accessibility. We were particularly interested in knowing what kind of struggles they faced in getting to and from the food banks or kitchens. What kind of pain points did they hit in their journey to obtain fresh produce? One visitor revealed to us that she has pays $5 to make a trip one way for an hour on the bus just to get to the food kitchen. When we asked her why she bothered coming to such a far away place, she told us that going to the food kitchen was not just about getting a meal. To her, the food kitchen has become a second home. She goes there to see her friends, feel entertained and catch up about what's been going on in the neighborhood. As we interviewed more people at the kitchen, we found that others felt the same way. People hang out around the kitchen after meals have been served, catching up with friends. The part of the food kitchen where meals are prepared and served to visitors. Flyers are posted on the board promoting local events, employment opportunities and more. The community board also advertises housing opportunities and information about the transportation system. The bus stop is conveniently located right outside the kitchen. Visitors make the trip from nearby and far away neighborhoods. Various produce is offered to visitors at the Community Human Services Food Pantry. Visitors wait patiently in line at St. Paul's Food Bank to check in and get bags of fresh produce. 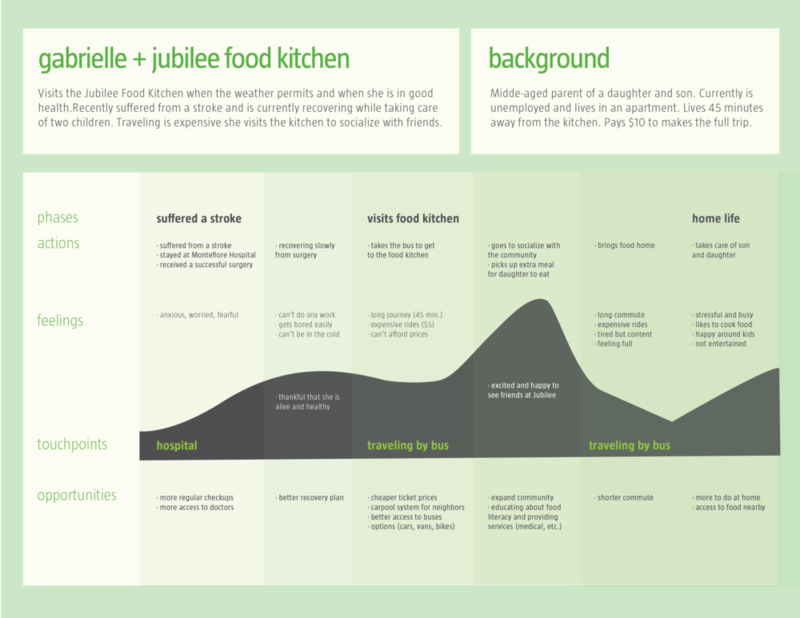 Our team summarized what we learned from the contextual inquiries by making a set of user personas and journey maps. 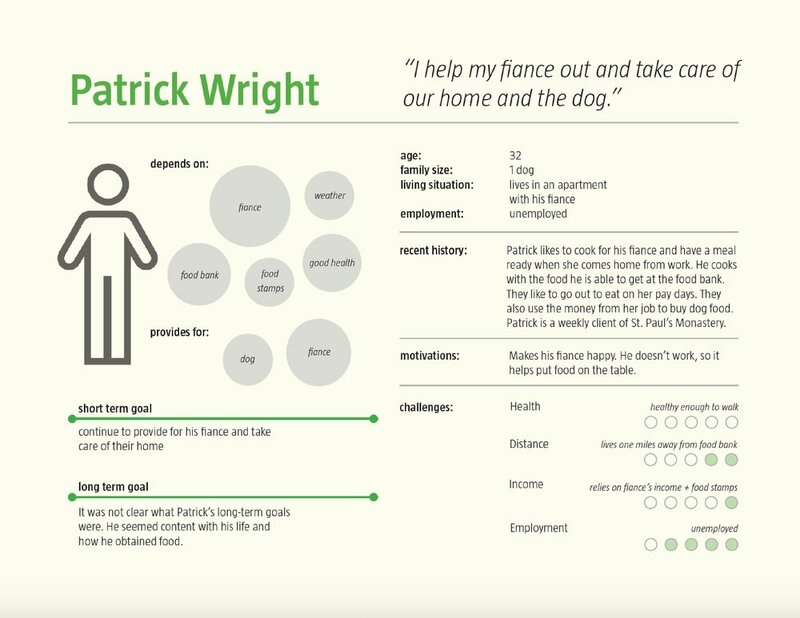 Creating user personas help ground us with realistic contexts and scenarios to design for as we move forward in our process. Personas help remind us of who we are designing for and why. Each persona expresses a clear set of motivations and challenges to keep in mind. Journey maps are visualized sequences of customer actions, separated into different stages that identify what a customer is thinking for feeling at a certain period of time. Do certain parts of the journey take longer than others? When are they frustrated? These maps provide a holistic view of what it's like to obtain fresh produce from the perspective of the customers. 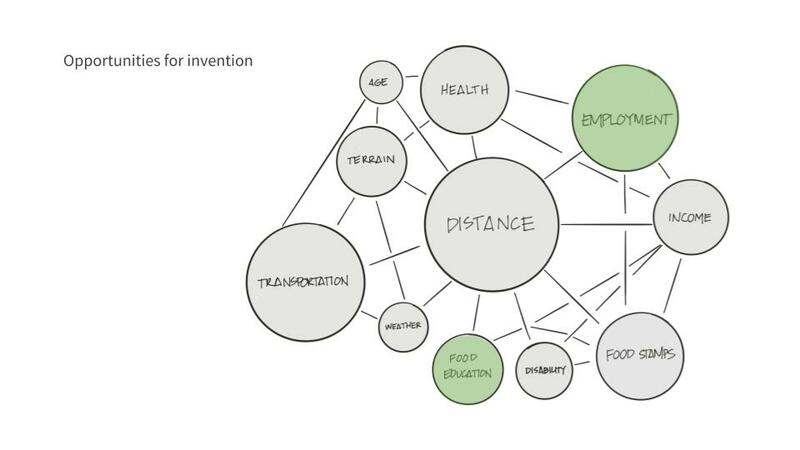 These diagrams also allow us to identify touch points and pain points in the user journey where there may exist design opportunities for intervention. As our next step, we created an affinity diagram to categorize the quotes and key findings we gained from the contextual inquiries. We sorted the quotes into small sections, adding a unique label to each category. This step really helped us understand, as a group, what kind of overall themes and problem areas we were working with in trying to create a solution. For example, one of the yellow category labels read: “Donations are unpredictable based on frequency and type”. 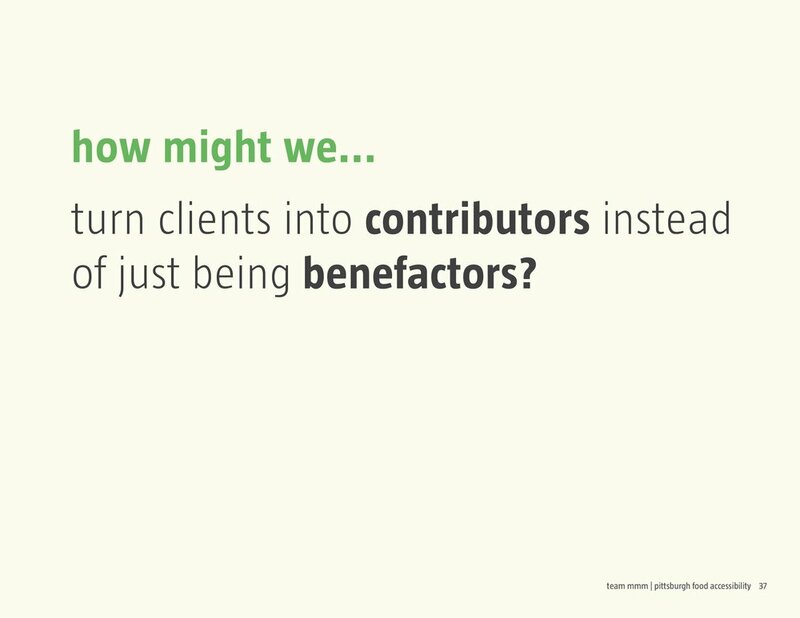 Our group could reference the quotes underneath that support the claim and then work from there to try and ideate what kind of interventions could be put in place to mitigate this unpredictable frequency in donations. We look at these themes and ask ourselves: What can we do? How can design be applied to this situation? We created a handful of “How Might We...” statements to get us thinking about the problems in a different light. Reframing the context of the problem helped us discover new approaches to the issue which we had not considered before. In parallel to this, we made storyboards that were aimed at answering the proposed questions. Storyboards help communicate to design ideas by putting them in the context of a relatable or believable narrative. 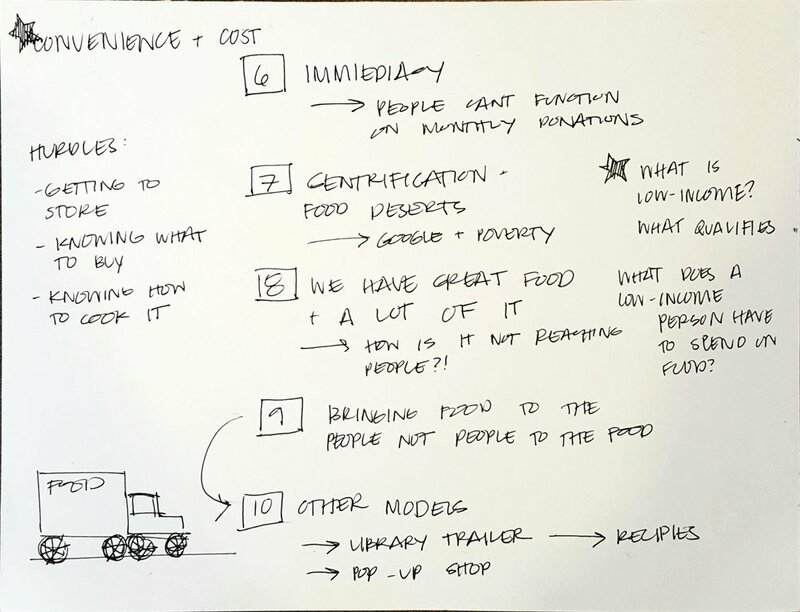 After assessing our findings around food accessibility, education and sustainability, our team brainstormed interventions that could potentially improve the experience of visiting a food bank or kitchen for all stakeholders involved. 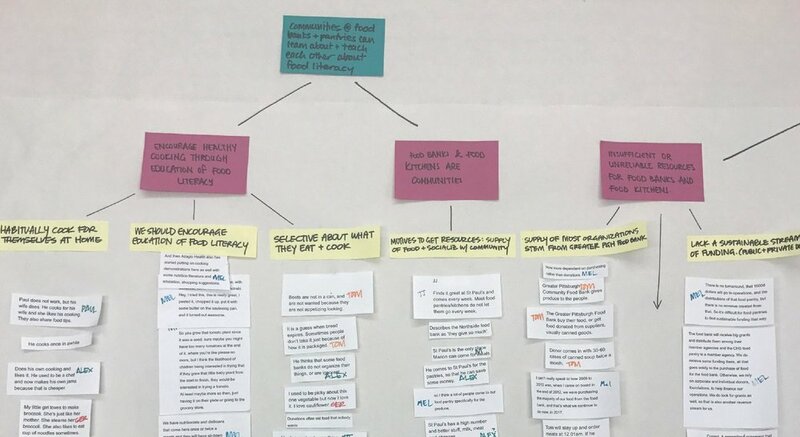 We proposed a new way for clients to exchange information on nutrition and meal preparation within the community through the use of recipe cards. 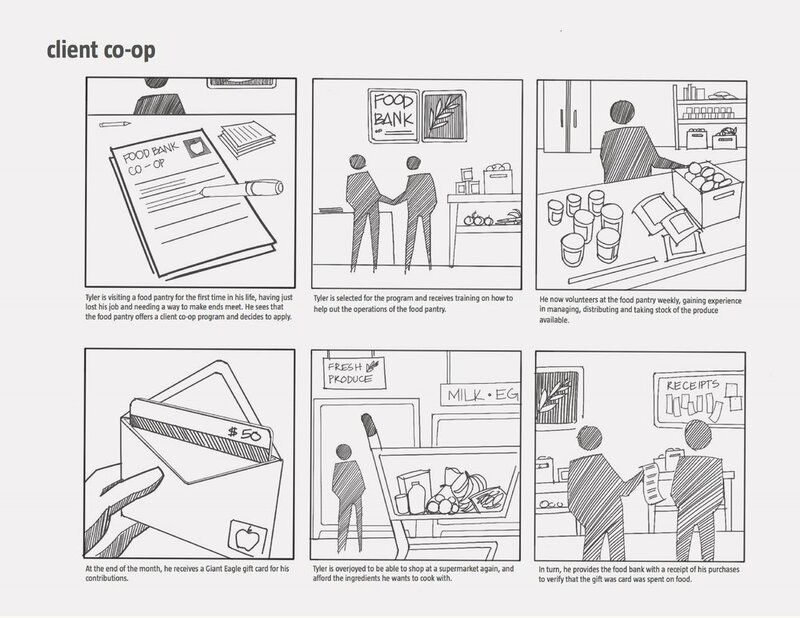 In addition, we developed a framework for a Co-op program that could be adopted by food banks to reduce visitor dependency on resources in the long-run. Discovery #1: Organizers would like to improve food literacy within the community but struggle to do so in an appealing and efficient manner. They also would like clients to make better decisions about the food that they are taking home from food banks and kitchens. How can we get them to pick from the more nutritious options? Customers tend to avoid fresh produce that they are unfamiliar with or looks unappealing to them. One-on-one sharing of simple recipes, however, has proven to be effective in getting people to feel more comfortable trying new ingredients in their meals. We felt that this method was something worth thinking about. How can we leverage the information that is already known by some members of the community to help educate those who are less aware, about food literacy and nutritional health? 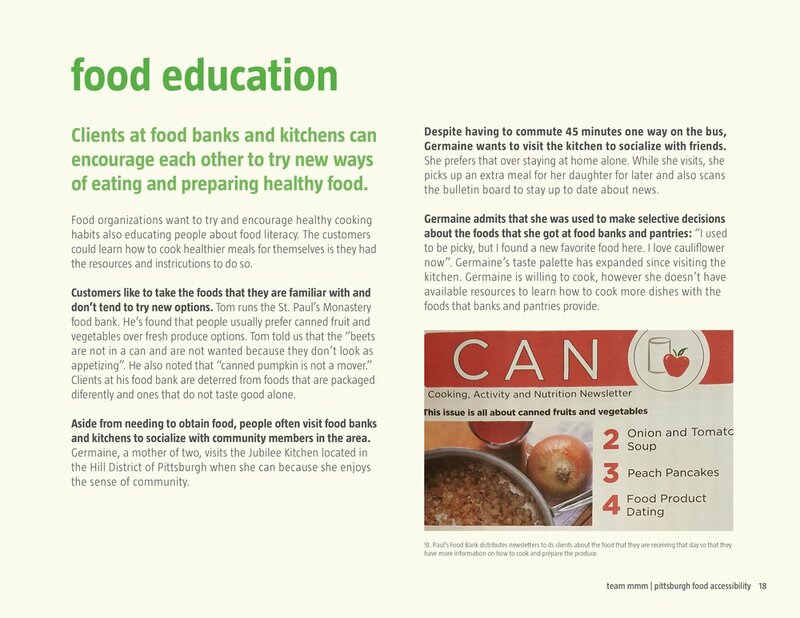 Intervention #1: Food bank community members can help each other learn about food literacy by sharing useful tips and delicious recipes. Our proposed solution leverages the existing network of clients at food banks in the area. We would create a way for clients to share recipe cards with one another. We imagine that they could share favorite recipes and tips by posting about them on the community board. Food kitchen organizers could also make use of the space offered by meal trays. We hope that this intervention would encourage visitors to try preparing and eating new foods that they find at the kitchen and food bank. Reading about other people's positive experiences with new foods should help them feel more comfortable trying it out. Most customers of food banks have been coming frequently for long periods of time. Some of them have difficulties finding work to support themselves, while others have simply become accustomed to obtaining food from the food bank. This causes some staff members to be concerned that these able bodied individuals are no longer part of the workforce even though they can still take on a job. Reducing dependency on food banks is a challenge that needs to be solved, but it is a multi-faceted problem. Intervention #2: Organizers could distribute managerial tasks to volunteers. Clients would benefit by gaining marketable skills. For customers to support themselves independently, they will need help developing the skills and experience needed to return to work. We want to provide clients with the opportunity to get operational work experience through a co-op program run by the food bank and its organizers. This solution might help clients, like Tyler, who is actively searching for a job so that he can have a steady stream of income. In return for volunteering their time at the food bank, clients would receive a gift card to a local grocery store. These gift cards would be purchased with reallocated money from third party organizations (groups that typically donate to the holiday programs held by food banks). If we had another month to work on this, we would have liked to return to the food banks to gather feedback on these ideas. Given the time constraints we had to work within, we did not get to test our ideas with clients. The participation of external clients throughout this project helped make it a successful one. It would have been nice to work with one of the organizations and implement one or two of the ideas temporarily. This probably would involve another round of interviews, user testing and research. Ultimately, we want to improve our proposed solutions such that they are appealing and effective at mitigating challenges to food accessibility. We would need to have more conversations with both clients and organizers. For example, could we actually identify a third party group that would consent to us using reallocated money for gift cards? If we can't, what is an alternative solution to that matter? We want to ensure that the solutions are feasible and most importantly, beneficial to everyone involved. There is still so much more research to be done but our work has helped give stakeholders something to think about.